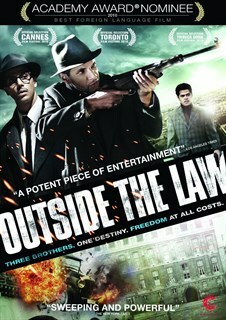 From writer/director Rachid Bouchareb (Days of Glory and Dust of Life) comes the Academy Award® nominated thriller Outside the Law, the story of three brothers who fight for Algeria’s independence from France after World War II. After losing their family home in Algeria, three brothers are scattered across the globe. Messaoud joins the French army fighting in Indochina; Abdelkader becomes a leader of the Algerian independence movement; Saïd moves to Paris to make his fortune in the shady clubs and boxing halls of Pigalle. Gradually, their interconnecting destinies reunite them in the French capital, where freedom is a battle to be fought and won.